Americans have long been taught that events such as the notorious My Lai massacre were isolated incidents in the Vietnam War, carried out by just a few "bad apples." But as award-winning journalist and historian Nick Turse demonstrates in this groundbreaking investigation, violence against Vietnamese noncombatants was not at all exceptional during the conflict. Rather, it was pervasive and systematic, the predictable consequence of official orders to "kill anything that moves." 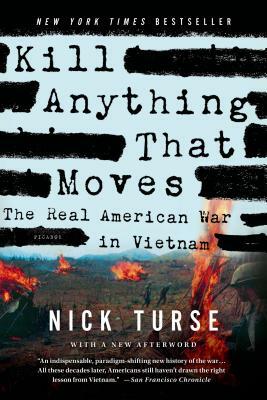 Drawing on more than a decade of research into secret Pentagon archives and extensive interviews with American veterans and Vietnamese survivors, Turse reveals for the first time the workings of a military machine that resulted in millions of innocent civilians killed and wounded-what one soldier called "a My Lai a month." Devastating and definitive, Kill Anything That Moves finally brings us face-to-face with the truth of a war that haunts America to this day. Nick Turse, an award-winning journalist and historian, is the author of The Complex and the research director for the Nation Institute’s TomDispatch.com. His work has appeared in the Los Angeles Times, the San Francisco Chronicle, and The Nation. Turse’s investigations of U.S. war crimes in Vietnam have gained him a Ridenhour Prize for Reportorial Distinction, a Guggenheim Fellowship, and a fellowship at Harvard University’s Radcliffe Institute for Advanced Study. He lives near New York City.